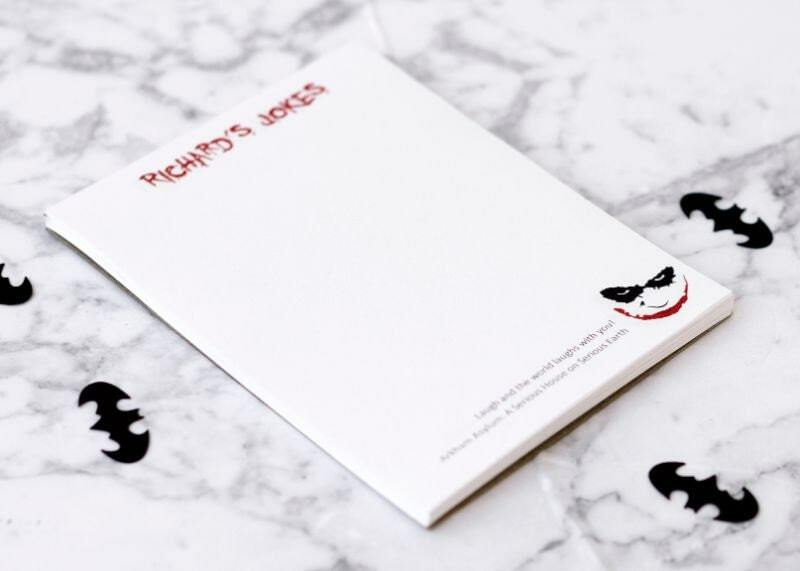 Perfect for the Joker Fan in your life. This Joker inspired Note pad personalized with your (or your friends) first name and 1 quote on the bottom. Choice of name colours and quote! Made using 24lb bond paper with either 50 or 100 pages. Page Size 4.25" wide by 5.5" high or 5" x 7". Includes a coordinating card stock backing. Makes a great gift for the villain fan in your life, or for you own desk or work space. 3. Your 1 quote, listed clearly and spelled as you wish it to appear. You can pick from my provided quotes or use your own. They will be collated when printed. 2. If you're good at something, never do it for free. 3. I'm not mad at all. I'm just differently sane. 4. I did it! I finally killed Batman! In front of a bunch of vulnerable, disabled kids!!! Now get me Santa Claus! 5. You know what they say, "dead men tell no tales". Hm. Which doesn't help a man trying to build a reputation in this town. 6. Wanna know how I got these scars? The quote will appear as it does in the photos in small font in dark grey to be discrete yet present. Depending on length of quote it will appear on one or two lines.